Great News! 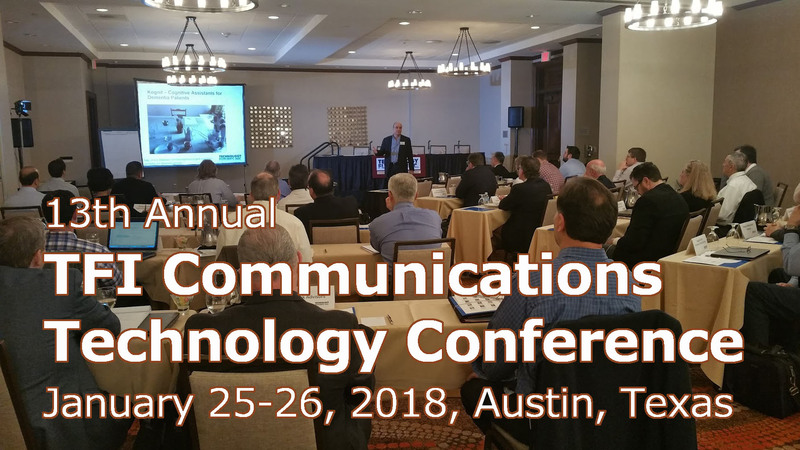 Registration is now open for the 13th Annual TFI Communications Technology Conference, Jan. 25-26, 2018. Join us in exciting downtown Austin as industry leaders and professionals gather once again to share the latest trends and developments impacting communications and asset valuation. the communications industry in 2018 and beyond. Don’t miss out! Take advantage of our Early-Bird Rate for General Admission and Assessors/Government/Academia! key forces impacting your organization! January 2017 Conference Highlights: We are working on a great speaker lineup for 2018! To give you an idea of the quality of our keynotes, speakers, and panelists, check out Videos, Slides, Keynote & Speaker Bios & Photos from the January 2017 TFI Conference. If you haven’t already had a chance to view the videos and slides from the 2017 TFI Communications Technology Forecasting & Asset Valuation Conference, be sure to check them out! Thank you Jon Williams and video team for a great job filming and editing the videos. You can select the videos and slides by speaker on the schedule. 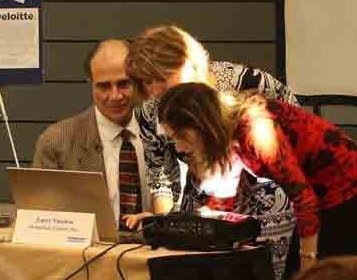 We also have posted lots of fun photos on the TFI Conference Facebook page. Thank you once again to all the great keynotes, speakers, sponsors, and conference attendees. We really appreciate all of your support and enthusiasm! We hope you will be able to join us at our 13th Annual TFI Communications Technology Conference, January 25-26, 2018. We’ll be meeting once again at the beautiful Courtyard Marriott Downtown in Austin Texas. We are working on a great speaker lineup and schedule for 2018 so be sure to revisit the site for updates! 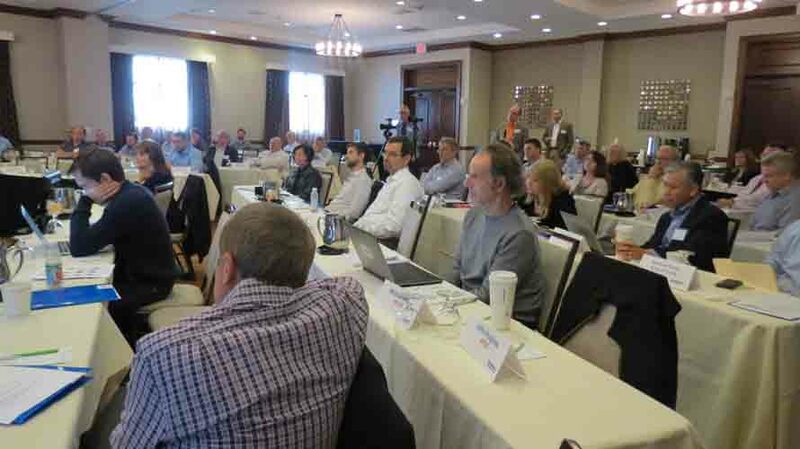 Thank you to everyone who attended the 12th Annual TFI Communications Technology & Asset Valuation Conference! We hope you left with lots of new ideas and inspiration from the content and connecting with the other attendees. Whether this was your first time or you’ve been coming for while, each of you brings something special that adds to the magic of the conference. We greatly appreciate you. We are particularly delighted that six of you were at the inaugural conference 12 years ago! A special thanks to our fabulous Keynotes, Guest Speakers, and Panelists. We couldn’t have done it without our wonderful Sponsors, AusConsultants, CostQuest, and Deloitte! Thank you, thank you, thank you! The Conference Slides are all up! Thank you to everyone who filled out our Critique Sheets. We particularly appreciated those who left kind comments that we can quote to attract attendees to next year’s conference. If you didn’t fill out a Critique Sheet, please click here to fill one out, or reply to this email with comments. We greatly appeciate endorsements! We will post pictures soon, followed by conference videos of the sessions. In the meantime, please let us know if you have any questions, comments, or if we can be of service. We are really looking forward to another great TFI Conference this week in Austin. We hope you can join us. If you haven’t already registered, there’s still time! For more information visit the TFI Conference Site or call us at (512) 258-8898 or email at info@tfi.com. It’s not to late to register! Below is the list of speakers and agenda. For more information, we invite you to visit the TFI Conference Site or feel free to call us at (512) 258-8898. Location/Accommodations: Courtyard Marriott Downtown, 300 E. 4th Street., Austin, TX, 512-236-8008 or 800-321-2211. The hotel is in walking distance to Austin’s best live music venues and restaurants and is near the Texas State Capitol, the University of Texas, and other popular Austin sites. We hope you can join us at the TFI Conference. We look forward to another wonderful year of learning, sharing, and networking! Happy New Year! For this year’s card, we focus on Happiness and Work/Life Balance! Our long tradition of designing our own holiday card around a trend continues with this year’s being Happiness and Work/Life Balance! Holiday verse by Dr. John Vanston & Carrie Vanston and design by Helen Mary V. Marek Take a fun walk through our Holidays Past! 2015 – Self-Driving Cars, 2014 – Philae Robot Landing, 2013 – Santa’s Drones, 2012 – Mayan Calendar, 2011 – Neutrinos, 2010 – New Technologies, 2009 – MiniTrends, 2008 – Stock Market, 2007 – Climate Change, 2006 – Ubuntu Greeting. Stop by our office and we’ll show you more! TFI Conference Hotel Room Block Expires January 11th! UPDATE: Good News! The Marriott has extended our room block one week. Attendees can reserve studio suites until Wednesday, January 11, at 5pm CST. If you can join us for the TFI Conference later this month and would like to stay at the conference hotel book your room today! Rooms in downtown Austin are very scarce the week of the conference. Our special rate for studio suites at the conference hotel is $249 per night plus tax. Rooms can be booked online or call the Marriott at 512-236-8008 or 800-321-2211 and mention you are with the “TFI Asset Valuation” group. And if you haven’t already, be sure to register now for the TFI Communications Technology & Asset Valuation Conference, January 26-27, 2017 in Austin Texas. We look forward to seeing everyone later this month. VR/AR has the potential to revolutionize media and have a tremendous impact on communications networks. In order to better convey the power and scope of this technology, TFI is producing a short film with examples of AR/VR ranging from gaming to cinema to industrial applications to you name it. A point/counter point discussion follows on the market potential for AR/VR, its impacts on broadband and video, and its bandwidth requirements. Fun and valuable! We know this season is super busy, so we are happy to extend our Early Bird Rates for the TFI Communications Technology & Asset Valuation Conference until Friday, December 16! Please register now. Be sure to check out the TFI Conference website for a complete list of our distinguished keynotes, guest speakers, and panelists, as well as the full schedule! Also, please make your hotel reservations ASAP! We still have a limited number of nice studio suites available for $249 per night (cut off is January 4 or when block is full). We hope to see you in Austin in January! The top conference in the country for sharing the latest trends, developments, and opportunities impacting communications and asset valuation just keeps getting better! Please see below for Guest Speakers, Panelists, and Agenda. Don’t miss our early bird rates! Register now for the 12th Annual TFI Communications Technology & Asset Valuation Conference Jan. 26-27, 2017 in downtown Austin. Don’t miss out! Take advantage of our Early-Bird Rate for General Admission and Assessors/Government/Academia for this Outstanding Event!